Fusion Academy is a private middle and high school, but don’t be quick to envision uniforms and lecture halls. At Fusion, classes are one-to-one: just one student and one teacher per classroom. This allows for the personalization of curriculum for each individual student’s strengths, interests, and learning style. Fusion is unique and has, in fact, broken many traditional school paradigms since its conception in 1989. This education model was born of frustration with the status quo and out of a passionate belief in the power of positive relationships to unlock academic potential. This unique, relationships-based school began when founder, Michelle Rose Gilman, began tutoring and mentoring students out of her home in Solana Beach, Calif.
After demand outgrew their space, Gilman and her teachers moved into a building and expanded their offerings to be the private, accredited, one-to-one school Fusion is today. In 2010, the first campus replication opened in Los Angeles, and the model has grown exponentially since to 36 campuses (and counting) across the country in California, Connecticut, Illinois, New Jersey, New York, Texas, Virginia, and Washington D.C. The educational experience at Fusion is completely customized to ignite a student’s passion for learning. Classes are self-paced, and course materials are presented in ways that suit students’ individual interest, strengths and challenges. It was modeled around the needs of students who weren’t finding their place in more traditional school environments – whether they struggled with mild learning differences, social issues, the rigid scheduling of more traditional schools, or boredom in a classroom not geared to accelerated learners. Along with personalized curriculum, Fusion’s one-to-one teaching model also allows for the customization of scheduling. Students may enroll at any time of the year, and take classes at a time of day that works best for them. This appeals to students who have demanding schedules outside of school because of involvement in sports or the arts. Each campus is unique but has “vibe” and culture that is similar to the original Solana beach campus. Each also includes a state-of-the-art recording studio and mixed-media art studio for students to express their creativity, and two Homework Café® spaces, one silent and one social, where students complete their homework before leaving for the day. 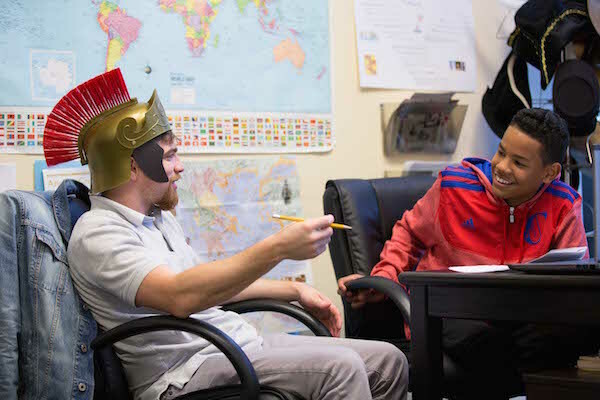 Some students enroll full time, while others utilize Fusion’s tutoring and mentoring services. Tutors are Fusion teachers who have mastered their subjects and are passionate about them. Families also turn to Fusion to support their homeschooling efforts with credit classes such as world languages and lab sciences. From algebra to yoga and everything in between, Fusion offers over 250 middle and high school courses, all of which meet state standards. Classes are available at three levels: essential, college prep and honors. Fusion teachers have also created classes for students when there was something students wanted to learn that wasn’t available in the catalog. All classes adhere to state standards. Creative expression is at the core of Fusion, as the faculty understands the pivotal role it plays in students’ well being. Fusion offers a robust roster of elective classes such as DJ Performing Arts, Graphic Design, Music Theory, Vocal Fundamentals, Recording Arts, Studio Art, Digital Photography, Film Studies, and more. Fusion’s Wellness Program complements the academic experience – providing balance and offering opportunities for emotional and social growth. It consists of 20 sessions across four elements: Art Expression, Music Expression, Physical Wellness and Healthy Habits. Like everything at Fusion, it is customized to each student. Art and music are considered pathways to healthy self-expression for Fusion students, helping them achieve more balance and deal effectively with stress, anxiety, low self-esteem, body image issues, social pressures and substance abuse. What makes Fusion work is the commitment to meeting students right where they are, creating a meaningful connection and finding the very best way to unlock each one’s passion for learning and discovery. Beyond academics, Fusion partners with outside therapeutic professionals to support students’ emotional health and help foster a balanced life. Fusion Academy's educational approach is one-to-one and is completely customized to ignite a student’s passion for learning. Classes are self-paced, and course material is presented in ways that suit students’ individual interests, strengths and challenges.